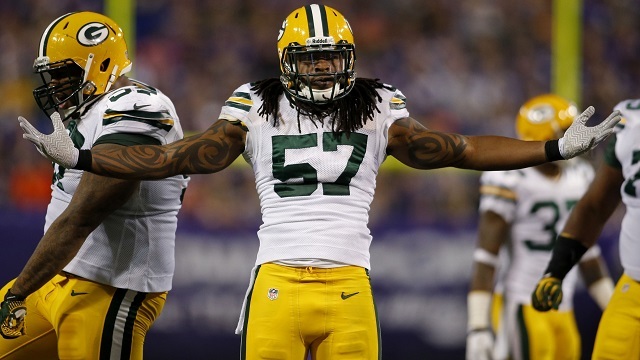 Home » Green Bay Packers: Who is Jamari Lattimore? Green Bay Packers: Who is Jamari Lattimore? Green Bay Packers linebacker Jamari Lattimore has done more than a favorable job filling in for the injured Brad Jones. While Lattimore has yet to become a household name, many fans wonder who he is. Lattimore attended Hialeah-Miami Lakes High School. He lettered in both track and football. On the field he held the position of defensive back, linebacker, tight end and even wide receiver. A well rounded versatile athlete. Jamari would take his game to Dodge City Community College for a lone season. During that time he recorded 60 tackles, nine sacks and one interception. Still not heavily recruited he took his only scholarship offer at Middle Tennessee State University. Lattimore would go on to break records for the Blue Raiders. Converted from a defensive end to a linebacker, as a junior Lattimore started every game. A game against Maryland saw him tie the school record for sacks in a game with three. Lattimore also recorded his first interception that year and returned it for a 23-yard touchdown against Louisiana. A junior season that saw him rank 16th in the nation in sacks, with 5.5, and second in the nation in fumble recoveries. As a senior Jamari Lattimore played in all 13 games. He broke the team record for sacks in a game when he recorded four sacks in one game during his final campaign. Ending the season with 68 tackles, 15 tackles-for-a-loss, 11.5 sacks and 2 blocked kicks. Good enough for a First-Team All-Sunbelt selection. Ironically while at Middle Tennessee State Lattimore only trailed former Green Bay Packer Erik Walden in career sacks. Walden had 22.5 career sacks to Lattimore’s 20.5. The Packers signed Lattimore as an undrafted free agent for the 2011 NFL season. During his time with the Packers, Lattimore has been used primarily as a special teams player. Poor play and an accumulated injury from inside linebacker Brad Jones has opened the door for Lattimore this season. Lattimore has made the most of his opportunity, and while not being overwhelming he has at least proved to be a consistent player and tackler alongside A.J. Hawk. During the 2014 season Lattimore has accumulated 28 total tackles to go along with 1 interception. 2013 saw Lattimore see action in 15 regular season games. During this span he was able to pile up 35 tackles, two sacks and a forced fumble. Jamari Lattimore has been somewhat of an unheralded player for the Packers’ defensive squad in 2014. If he continues to be consistent and put up respectable numbers he may just well cement himself in the middle of the defense.